Use Lucky Patcher for in-app purchase – Hey guys I am back again with another trick. The trick is about how to crack/hack any android game using lucky patcher. Lucky patcher is full of incredible option which will change the app work, and you will get most out of your Apk. The lucky patcher is one of my favorite app which helps me to customize any apps in my phone list. The best thing I love about this app is, it will give the option of removing Google ads .becuase sometimes google ads will disturb you😉 and I always remove ads from my apps. Lucky Patcher is an app which is developed by chelpus. This app is used to remove google annoying ads from apps. You can also modify app permissions such as disable package, clone application, backup of an app and so many features by lucky patcher. Now you can download the latest lucky patcher apk on your smartphone. This app is available for Android platform as well as Ios😀. This app is available for iPhone users. So if you have ios then you can perform all functions like remove license verification, remove google ads, modify apk, disable packages and backup function on your ios device. You can download the lucky patcher application for any Android smartphone, but it requires Root permission. Yes, i think you need root permission for doing all such task which is mentioned above in the article. 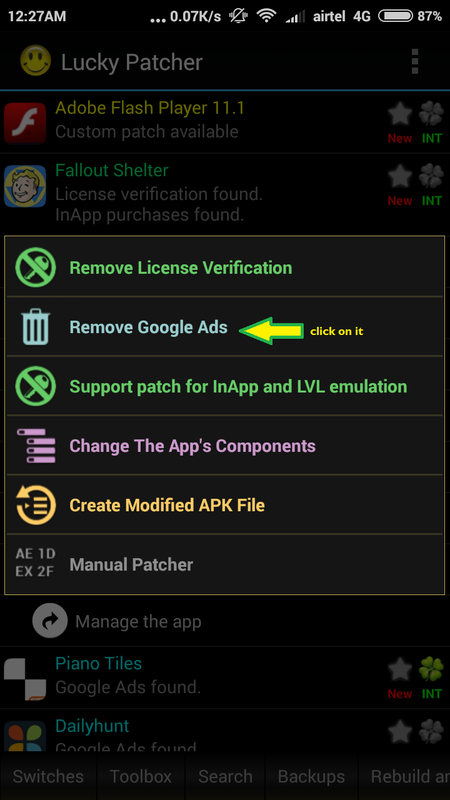 The tasks are listed such as remove license verification of app, lucky patcher for in-app purchase, remove google ads, support patch for in-app and LVL emulation and also it gives your the option for changing the app’s components and then the last task you need to make/create modifies apk file. There is some basic key feature of lucky patcher app also advanced features which you can use on your device. Just download the latest version of apk from above and start testing all features. Important and useful features are listed below. Remove License Verification– it enable us to Remove the license verification from any app, but sometimes it would not work. Remove Google Ads– I love this function because I don’t want to see any ads on my favorite apps/games also some apps providers offers ads free version at some minimal price. Create Modified APK file– Yes, I love it this function which is not available on any apps. I think you may hear about modified apps, so it will help you to make your modified version of an app. First of all, you have to download the latest version of apk From above requirements. Just choose any App/Game from a list which you want to patch. Finally, you patched the application successfully. Now Select any apps or games from your app list and just click on it. Firstly you need to open Lucky Patcher. Just Select any App or Game from the homepage of the lucky patcher. Click on Remove Google Ads. Question 1: – Who is the developer of the app and how do I use lucky patcher? Answer: – This fantastic app developed by the Chelpus and he made this app for solving common Android apps problem of the users. He made this app for a rooted phone, and it requires some permission for performing an unbelievable task such as removing annoying ads from the game, create modified apk and so many features users might perform by this app. It is the custom patching option which will let you do some additional patching like all patchable things in one click. Suppose you want to remove ads and remove in-app purchase from the apk then this option will do it for your just in one click. Answer: – Yes, you can use lucky patcher in a non-rooted android phone but it offers some limited options for a non-rooted device, and these options or features are Create Modifies apk, Backup, and hack In-app purchase. Answer: – This app is mainly created for root users so if you have an Android smartphone with root permission, then you can install it from above-given download link and start using it. Question 4: – Can lucky patcher app hack online games? Answer: – No, you can’t hack any online games because the online games require hosting permissions and these type of games are accommodated in some online hosting place. So there is a rare option for online hack games. Question 5: – How to use Lucky Patcher on Clash of clans? Answer: – I didn’t try this app on COC game because I don’t play clash of clans, and I think this will work on this game. Naturally, you need to download lucky patcher apk from above and start testing on coc game and tell me through comments. This app requires root permission, and it will do or perform at its optimum level on the rooted device. Also, it works on the non-rooted device. You can perform a basic operation and function like remove license verification, eliminate annoying ads, create modified apps and so on. I think this will help you to make your modified app. Thanks for visiting my blog. Please do share it if you got some good knowledge regarding how to use lucky patcher and its functions. If you have any doubts regarding this tricks, shoot your comment below, and I will surely answer them. Will it be useful to buy free packages in age of kings? If yes what must we do for it to buy free packages….. I am not sure about the age of kings free packages. If the lucky patcher is not able to solve your problem then you need to download the modded version of age of kings. Also lucky patcher app is not useful in server based game.